Capt. William Lowell, USNR, chief operating engineer at Bath Iron Works Corporation (BIW), was the featured speaker at a recent dinner meeting of the Northern New England Section of the American Society of Naval Engineers. The meeting was held at the Commissioned Officers Club, Portsmouth Naval Shipyard, Portsmouth, N.H.
Capt. 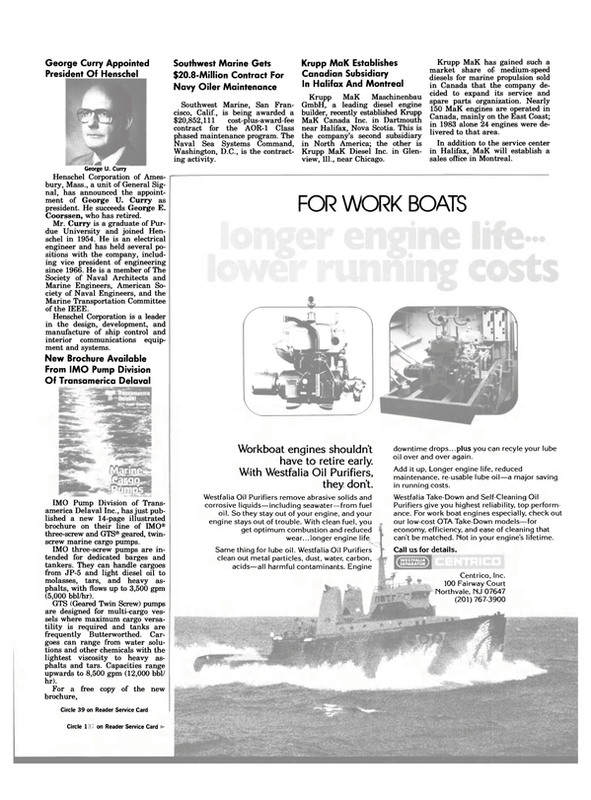 Lowell stated that many private shipyards in the U.S. face uncertain futures. American goods are being shipped in foreignbuilt and foreign-operated ships for the most part. He recognized the predominance of Japanese shipbuilding and the rapidly growing Korean capability. Between government subsidies and lower labor rates in those countries, the U.S. cannot compete effectively. However, the recent launching of the Falcon Champion, a BIW product, may be a catalyst for the U.S.
shipbuilding considering the ship's quality, reasonable cost, and being delivered ahead of schedule. While certain factors cannot be controlled, the U.S. can put out fine ships if given the opportunity, he said. During the meeting Comdr. John Hallett, USN (Ret. ), was presented a donation from the Section to the Kittery Historical and Naval Museum.